I just traveled from Whitehorse, Yukon Territory, Canada to Haines, Alaska today, in a car ride punctuated by frequent photo stops. The landscapes were enhanced by low-lying fog, so look for future blogs showcasing some of those images or visit my gallery website to see the final cuts. Driving through the mountain passes, I descended toward the ocean in Haines and set my watch back an hour. I found the ride a bit difficult due to a cracked rib injury I sustained during my drive up the Dempster Highway last week. Still, I made it to Haines in time for lunch, except I decided instead to just check out the bear situation first. Needless to say, that diversion delayed lunch for about three hours. No sooner did I hit the bear viewing area than I saw a female grizzly with three cubs wading into the Chilkoot river fishing for salmon. 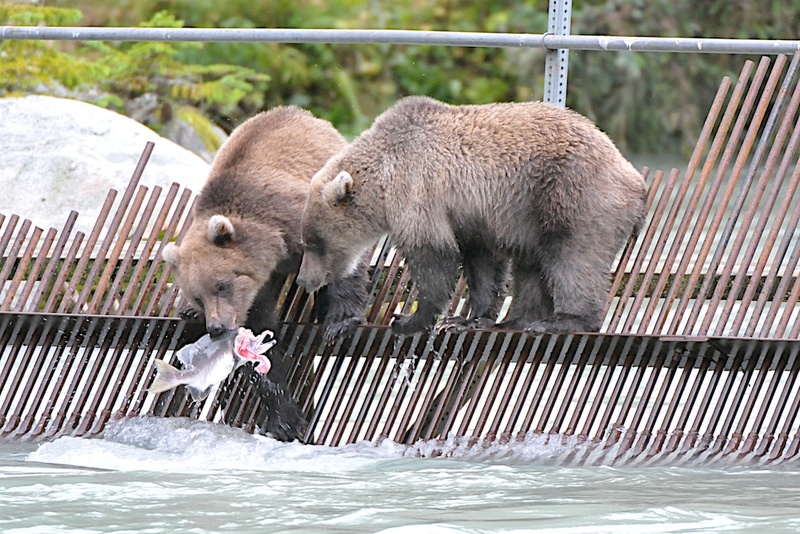 This is prime gorging time before the bears settle into their winter sleep (technically, they do not hibernate). Unfortunately, but fortunately for the tourists, a large cruise ship was in port and a throng of people crowded the shore viewing the bears. There is no question in my mind that there will eventually be a bad bear-human interaction here and it won’t be the fault of the bears, who will have to then be killed. Some of the humans were taking downright stupid chances with animals that could kill or maim them in one swat of their powerful claws. After lunch I went back for a second shooting session, although lugging around my tripod and telephoto howitzer was painful at times. I did manage to see a second female with two cubs as they fished together on a fishing weir. 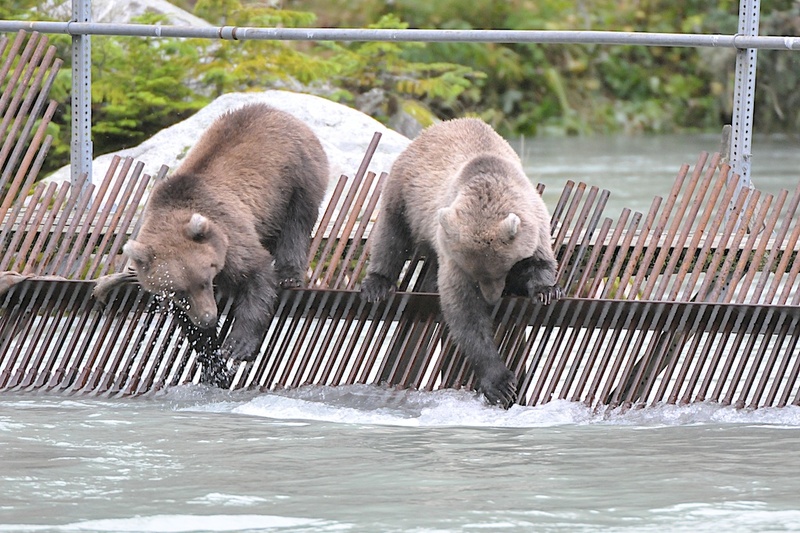 For those of you unfamiliar with the concept, a weir is a series of poles set into a river to trap fish, a definite attraction for hungry bears. Minutes later the cubs were successful, having caught a delicious salmon snack, which they shared on the nearby river bank. I’m sure looking forward to tomorrow. The weather promises to be better. Today it was cloudy and drizzly, not really ideal for wildlife images. After a good night’s rest I hope my rib(s) will improve.